The Martin D-21 is a transitional model, fitting into the space between the mahogany body D-18 and the Rosewood D-28. 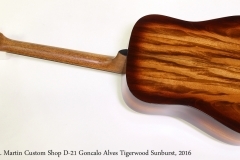 The ’21’ designation essentially marks the point where Rosewood is used in place of Mahogany for back and sides, Ebony for fingerboard and bridge instead of Rosewood, and a bound fingerboard. Beyond that, trim escalates quickly, with more complex binding, higher grades, and elaborate inlay sets. This guitar is built with a Sitka Spruce top, Goncalo Alves for the back, sides and head plate, Mahogany for the neck and Ebony for the bridge and bound fingerboard. A Sunburst finish has been applied, with the sides included in the shading pattern – the waist is shaded darker. 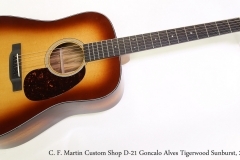 This unusual and striking Custom Shop D-21 is in great condition with only the slightest wear. 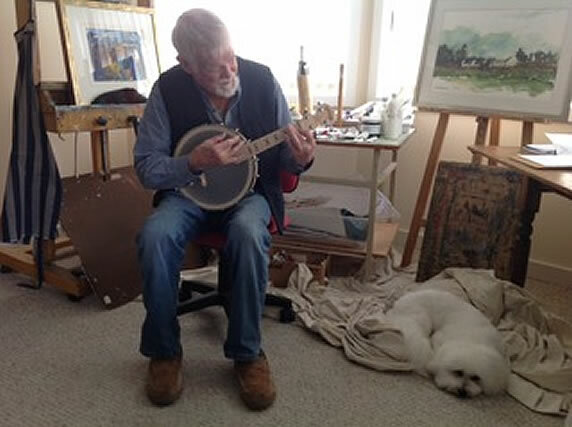 Tonally, it’s between a D-18 and a Rosewood D-21, though it could be that it simply hasn’t been played enough to open up its full voice. The finish is very clean and glossy, with no appreciable wear. Fret wear is negligible. The original Martin hard shell case is included.